Learn how to prepare traditional Spanish recipes with the personal touch of an expert Spanish chef! Join us on our 4.5-hour tour accompanied by an expert professional culinary guide, visiting the Mercado de San Miguel, one of the city's oldest and most beautiful markets, where we will taste traditional products! 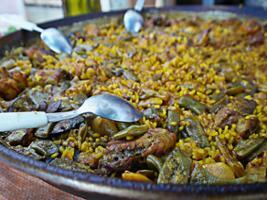 Relish an amazing cookery class, making paella and traditional Spanish tapas in a highly exclusive and unique setting! We will be delighted to offer you this comprehensive experience in Madrid, so you can cook a true Spanish paella, with a varied selection of tapas and visit the historic market - Mercado de San Miguel, like a true local. Have fun and feel unique in your experience in a Premium Small Group tour. 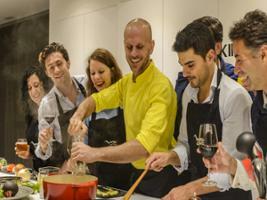 Revel in one of the most exclusive cooking classes in Madrid in a true VIP Experience! 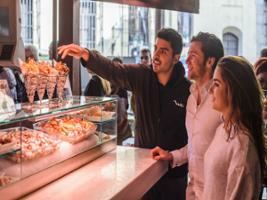 First of all, we will take a walking visit through the Mercado de San Miguel, an authentic market where you can find the essential ingredients of Spanish cuisine. 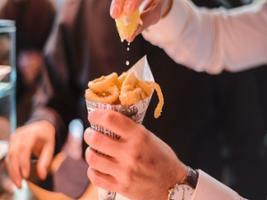 Pay attention, because before leaving, we will do a stop to take a glass of Albariño and taste an Oyster or/and Seafood in the historic market. Come and cook our spectacular and unique cuisine with us. A unique place in the city offering the perfect setting to learn how to cook like a true local. You will cook four traditional dishes, ranging from the popular paella and potato omelette to local lesser-known delicacies. And, of course, you will subsequently savour the food you have cooked! 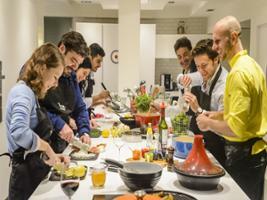 The private cooking classes – "The Ultimate Market & Gourmet Cooking Class: Tapas, Paella & Sangria" are given by an expert culinary guide and an English-speaking professional chef from Madrid. Together we will prepare an amazing menu, accompanied by a free bar of unlimited drinks. Lastly, all that is left is to sit down to taste and relish the fruits of your labour accompanied by fine Spanish wines, you decide how much you want. Have fun and feel unique in your experience in a Premium Small Group tour. Children under 3 years old go free. Please inform us in advance of any food intolerance or allergy. Any menu could be changed by chef, season or availability.